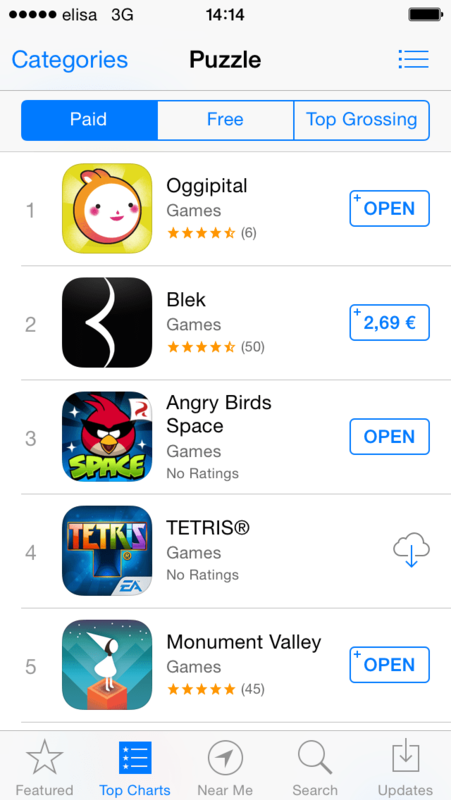 Oggipital did quite nicely in Finland: it topped the overall charts with positions 11. and 16. on the iPhone and iPad, respectively. On Games it topped 4th, and on Puzzle game category it was actually no. 1 for a day! While this is fantastic, the downside is that the peak is hard to sustain, and the market is small in Finland. So from a monetary perspective, it’s not a great success. But for what I was looking for with this first release – to enter the market and gain some media attention – it was certainly successful! Very happy with the whole release weekend. The plan is to update Oggipital with a few new features and some score balancing, as well as a couple of bug fixes, in the coming weeks. Parallel to that, I’ll try to drum up some international media attention to it. Next week I’ll attend Pocket Gamer Connects game conference in Helsinki, and hoping to meet some press and fellow game developers there.